, third duke of Bridgewater, was born in 1736, and was the fifth son of Scroop, the first duke of Bridgewater, by lady Rachel Russel: by the death of his brothers, he succeeded, on the demise of his brother | John, second duke, in 1748, to the Lille and estates. Of those illustrious characters that have done honour to the British peerage, the duke of Bridgewater deserves to be placed in the first rank. That time and fortune which too many others have devoted to purposes, if not injurious to society, at least useless, his grace spent in pursuits that entitle him to be called the benefactor of his country. 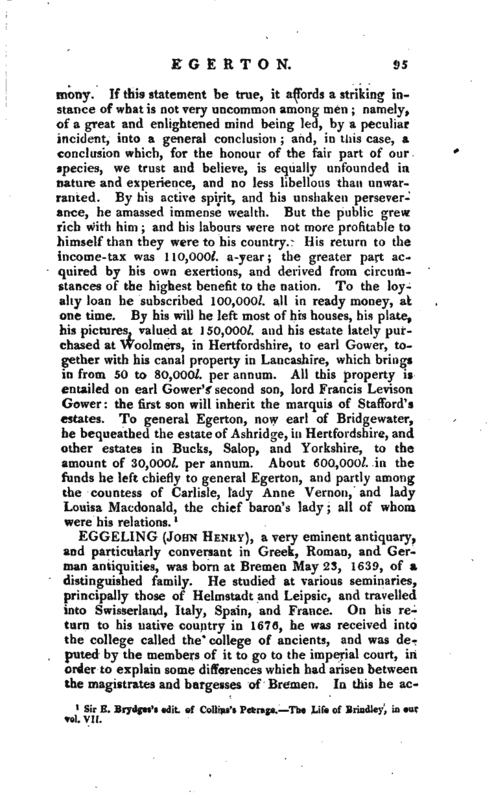 It is understood that his grace before be came of age, digested the plans which he afterwards prosecuted with such success, and proceeded to put them in execution as soon as he obtained possession of his paternal inheritance. 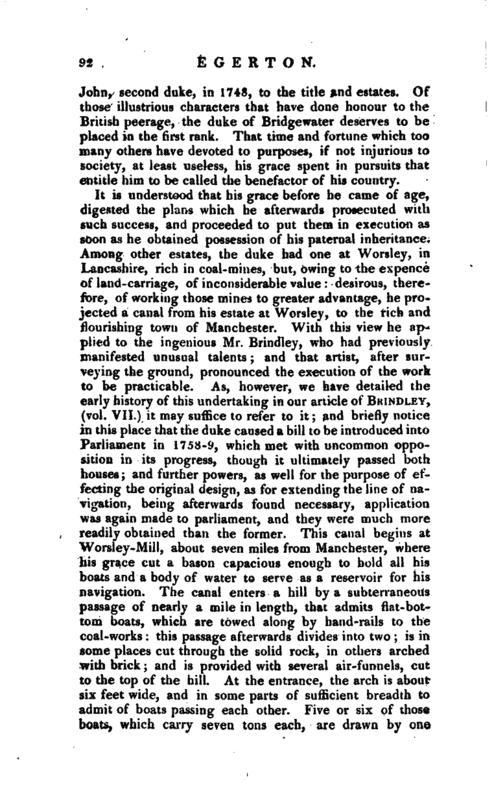 Among other estates, the duke had one at Worsley, in Lancashire, rich in coal-mines, but, owing to the expence of land-carriage, of inconsiderable value: desirous, therefore, of working those mines to greater advantage, he projected a canal from his estate at Worsley, to the rich and flourishing town of Manchester. With this view he applied to the ingenious Mr. Brindley, who had previously manifested unusual talents; and that artist, after surveying the ground, pronounced the execution of the work to be practicable. As, however, we have detailed the early history of this undertaking in our article of Bkindley, (vol. VII.) it may suffice to refer to it; and briefly notice in this place that the duke caused a bill to be introduced into Parliament in 1758-9, which met with uncommon opposition in its progress, though it ultimately passed both houses; and further powers, as well for the purpose of effecting the original design, as for extending the line of navigation, being afterwards found necessary, application was again made to parliament, and they were much more readily obtained than the former. This canal begins at Worsley-Mill, about seven miles from Manchester, where his grace cut a bason capacious enough to hold all his boats and a body of water to serve as a reservoir for his navigation. The canal enters a hill by a subterraneous passage of nearly a mile in length, that admits flat-bottom boats, which are toweci along by hand-rails to the coal-works: this passage afterwards divides into two; is in some places cut through the solid rock, in others arched with brick; and is provided with several air-funnels, cut to the top of the hill. At the entrance, the arch is about six feet wide,and in some parts of sufficient breadth to admit of boats passing each other. Five or six of those boats, which carry seven tons each, are drawn by one | horse to Manchester. In other places, the canal is carried over public roads by means of ardhes; and where the road is too high, it is gradually lowered, and rises on the opposite side. But one of the most arduous works accomplished on this canal is the aqueduct over the river Irwell, where the canal runs forty feet over the river, and where the barges are seen passing on the former, and the vessels on the latter in full sail under them. This aqueduct begins three miles from Worsley, and is carried for more than two hundred yards over a valley. When the works approached the river, several artists pronounced their completion impracticable; and one went so far as to call it “building a castle in the air.” Had the duke attended to these opinions, without doubt delivered by men of skill and penetration, he would have relinquished his purpose; but his own sagacity, and his confidence in the assurances of Mr. Brindley, determined him to persevere; and the aqueduct over the river Irwell will for ages remain as a monument of the public spirit of his grace the late duke of Bridgewater, and of the rare abilities of the artist; while it may also read a salutary lecture on the imbecility of human judgment and human foresight. 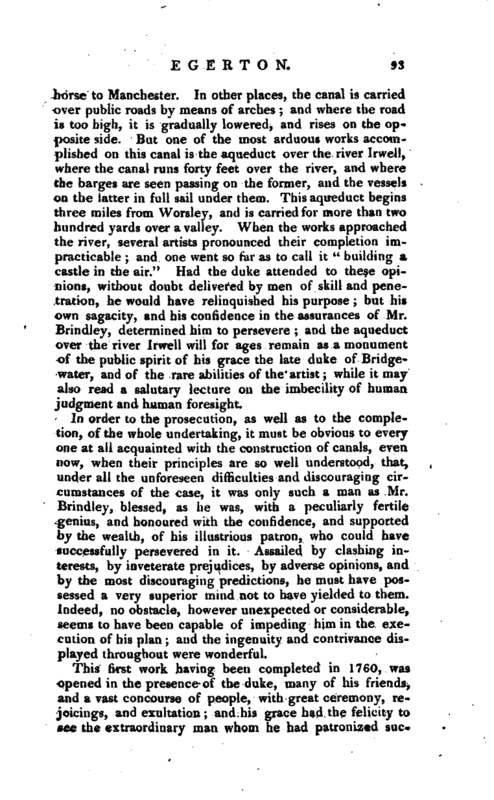 In order to the prosecution, as well as to the completion, of the whole undertaking, it must be obvious to every one at all acquainted with the construction of canals, even now, when their principles are so well understood, that, under all the unforeseen difficulties and discouraging circumstances of the case, it was only such a man as Mr. Brindley, blessed, as he was, with a peculiarly fertile genius, and honoured with the confidence, and supported by the wealth, of his illustrious patron, who could have successfully persevered in it. Assailed by clashing interests, by inveterate prejudices, by adverse opinions, and by the most discouraging predictions, he must have possessed a very superior mind not to have yielded to them. Indeed, no obstacle, however unexpected or considerable, seems to have been capable of impeding him in the execution of his plan; and the ingenuity and contrivance displayed throughout were wonderful. This first work having been completed in 1760, was opened in the presence of the duke, many of his friends, and a vast concourse of people, with great ceremony, rejoicings, and exultation and his grace had the felicity to see the extraordinary man whom he had patronized | succeed even beyond his expectations. But the duke’s designs were not confined to this canal: accordingly, after another application to parliament, in 1762 he obtained powers (though not without great opposition) to extend the works from Longford bridge to the river Mersey; and the success of ibis undertaking furnishes an additional proof of his grace’s judgment. The entire length from Wbrsley to Manchester is twenty-nine miles: there is not any fall on the whole line, except at Runcorn, into the river Mersey, where there are locks which convey the boats down ninetyfour feet into the river in a very short space of time. The whole was accomplished in about five years. 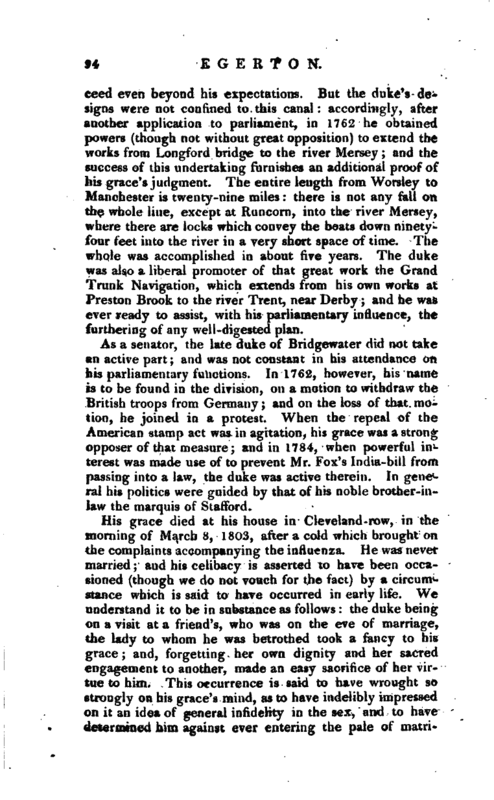 The duke was also a liberal promoter of that great work the Grand Trunk Navigation, which extends from his own works at Preston Brook to the river Trent, near Derby; and he was ever ready to assist, with his parliamentary influence, the furthering of any well-digested plan. As a senator, the late duke of Bridgewater did not take an active part; and was not constant in his attendance on his parliamentary function-. In 1762, however, his name is to be found in the division, on a motion to withdraw the British troops from Germany and on the loss of that motion, he joined in a protest. When the repeal of the American stamp act was in agitation, his grace was a strong opposer of that measure; and in 1784, when powerful interest was made use of to prevent Mr. Fox’s India-bill from passing into a law, the duke was active therein. In general his politics were guided by that of his noble brother-inlaw the marquis of Stafford. Sir E. Brydges’s edit. 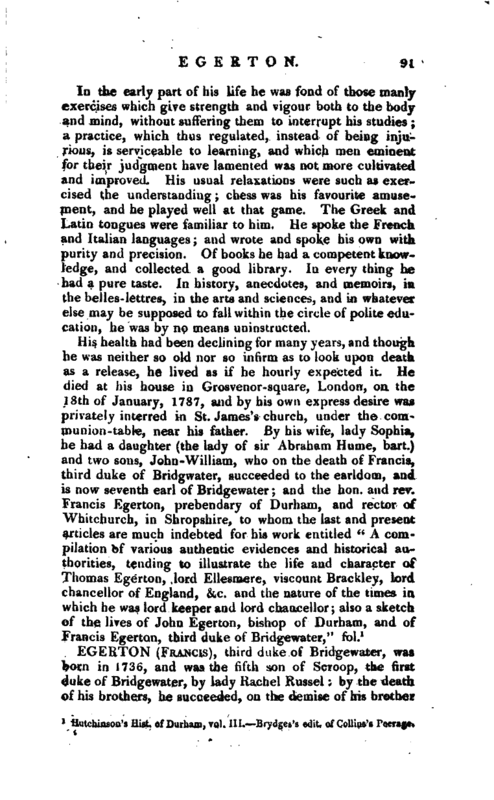 of Collins’s Peerage.—The Life of Brindley, in ur vol. VII.